Did you know that 5th of February is the day of one of the most delicious eatable things of the world (of course in my idea and many others). We want to celebrate this activity simultaneously in one of the LILLE AND ALSO TEHRAN'S nutella bars. The first World Nutella® Day was established by the American blogger Sara Rosso on February 5th, Protected content . Happiness is a warm taste of hazelnut spread on a warm flaky pastry! That hazelnut spread is known across the world as Nutella. It can be spread on toast or put into the center of pastries or other baked goods. I don’t know about you but I have been known to consume it simply with a spoon or finger! Don’t laugh! I’ve seen others use pretzel sticks to get their taste of it or even potato chips! I’m sure if you are a fan you have your favorite way to get your Nutella fix! World Nutella Day is the day to share all your ideas with the world! World Nutella Day was first celebrated in Protected content . The idea for the day came from Sara Rosso who was an American blogger who was living in Italy at the time. What made her think to start World Nutella Day? Why her love of the product of course! The fans of Nutella embraced the day with gusto and took the joy of the day to social media around the world! Protected content the transfer of the Day from Sara to the company that makes Nutella, Ferrero. Making this transfer allowed for the day to become even larger and ensured its longevity. The company has done some pretty creative things to support World Nutella Day. 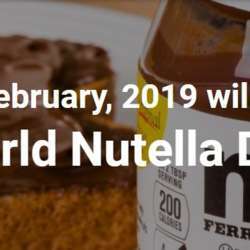 There is a website (nutelladay.com) to keep current on all of the plans for the holiday. You can even sign up for a chance to become the Chief Nutella Ambassador!